It wouldn't be a holiday feast without a warm, fragrant dish of Southern Cornbread Stuffing -- an easy and flavorful side dish! 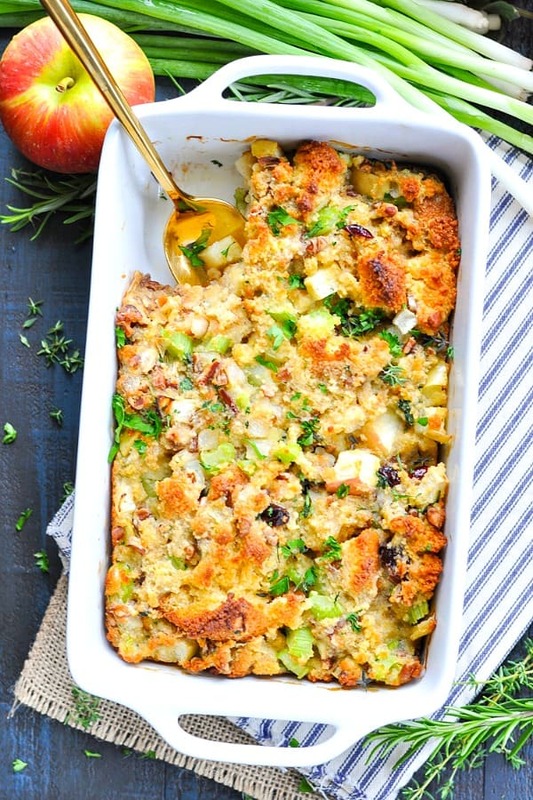 It wouldn’t be a holiday feast without a warm, fragrant dish of Southern Cornbread Stuffing! Loaded with cranberries, apples, pecans and sausage, this easy side dish is the perfect companion for your golden roasted turkey! Every home cook probably has her favorite stuffing recipe that she swears is the best! From sausage dressing to oyster stuffing or the classic Southern cornbread stuffing, there’s a special version for every unique holiday celebration. Sweet and juicy apples, tart and chewy cranberries, and crunchy toasted pecans are mixed with buttery cornbread, Italian sausage and fresh herbs for the most flavorful and satisfying cornbread stuffing! Best of all, it’s so darn easy and can be made in advance! Once all of the ingredients are cooked, it’s just a matter of stirring everything together and baking it in the oven. Can Cornbread Stuffing be made Ahead of Time? To make this cornbread stuffing ahead of time, assemble as directed, cover and refrigerate for up to 24 hours. 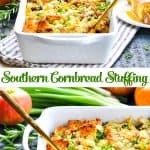 Can I freeze Cornbread Stuffing? Yes! 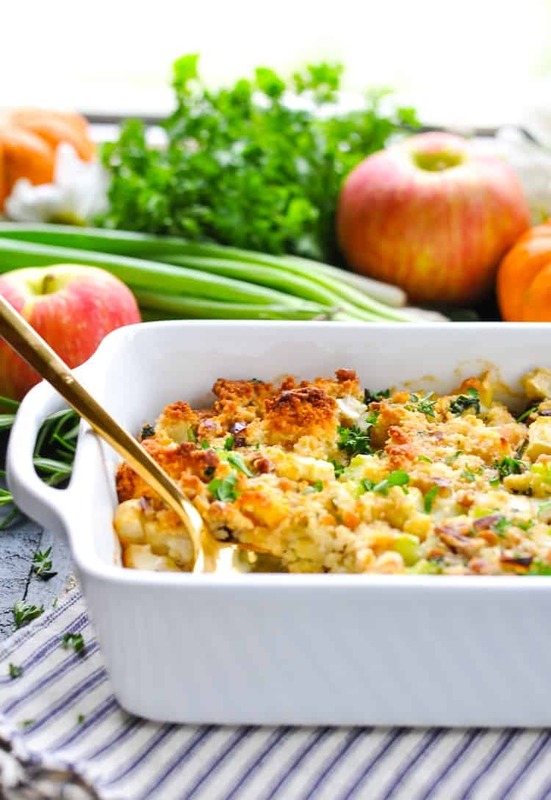 If you’d like to prepare your cornbread stuffing far in advance, you can assemble the stuffing as directed, cover tightly with foil, and freeze for up to 2 months. The day before Thanksgiving, allow the stuffing to thaw in the refrigerator overnight. Once thawed, bake the cornbread stuffing according to the instructions below. 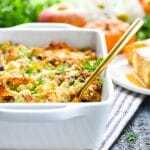 This cornbread stuffing with sausage is hearty and delicious! However, if you would prefer a Southern Cornbread Stuffing without sausage, simply omit the sausage and cook the celery and onion in about 4 tablespoons of butter (instead of in the sausage fat). The rest of the instructions remain the same. I used a box of Krusteaz Honey Cornbread to prepare this recipe; however, you can use any cornbread that you prefer. You can make a Jiffy Cornbread Stuffing using a Jiffy Mix — you’ll just need 2 of the small Jiffy boxes instead of one large Krusteaz box. For a shortcut, purchase a pan of cornbread or corn muffins from the bakery section at your grocery store. A dry, day-old cornbread works best in this recipe. You can leave the cornbread out and exposed to the air to get slightly stale before using, or you can toast the cornbread in the oven. To toast cornbread cut the cornbread into cubes. Spread the cubes on a rimmed baking sheet that has been lined with parchment. Toast in a 350-degree F oven for about 20 minutes, flipping halfway through, or until browned and crispy along the edges. 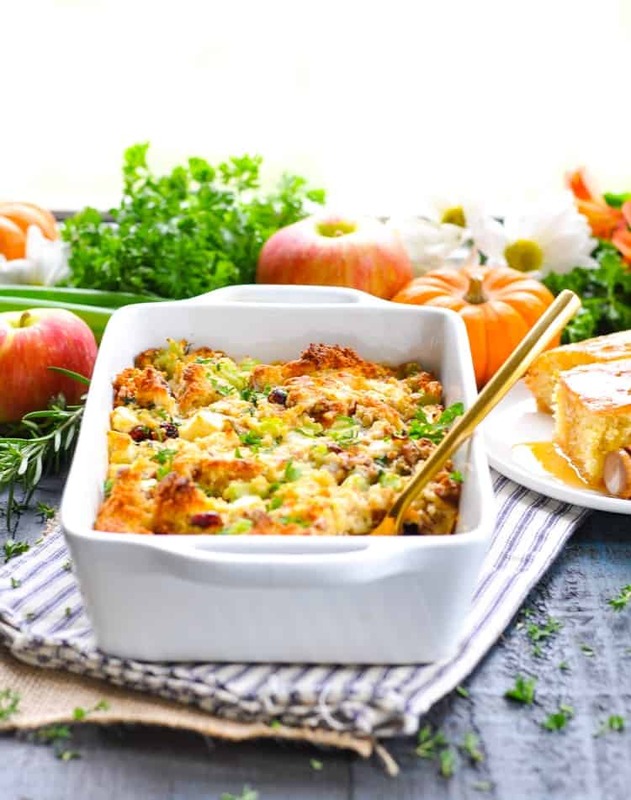 If you’re preparing my Easy Maple-Glazed Roasted Turkey Breast or my Garlic & Herb Roast Turkey Breast, I can assure you that this cornbread stuffing will pair perfectly with your entree. Do you need even more ideas for your holiday feast? I have so many favorites that I almost don’t know where to start! You can’t go wrong with my 4-Ingredient, 4-Minute Corn Pudding, my Easy Apple & Sweet Potato Casserole, or my Dreamy 6-Cup Ambrosia Salad. Want something green? You’ve GOT to try Fannie’s Easy, Cheesy Broccoli Casserole! Whether you serve my favorite Southern Cornbread Stuffing on Thanksgiving, with a roast chicken for your next Sunday supper, or with your holiday ham on Christmas, I hope that you enjoy the warm, fresh, sweet, and savory blend that I adore! Preheat oven to 350 degrees F. Spray a 2-quart baking dish with cooking spray and set aside. In a large bowl, combine cornbread, pecans, apple, and cranberries. Set aside. Crumble the sausage into a large skillet. Cook over medium heat, stirring frequently, until browned, about 8 minutes. Remove the sausage crumbles from the pan with a slotted spoon and place in the large bowl with the cornbread. Add onion and celery to the skillet with the sausage drippings, cooking until tender (about 5-7 minutes). Add herbs (parsley, rosemary, sage, and thyme), and cook until fragrant (about 1 more minute). Transfer onion and herb mixture to the large bowl with the sausage and cornbread. Add eggs, salt and pepper; stir to combine. Stir in the chicken broth until the stuffing is moist but not mushy (you may need more than 2 cups). Transfer the stuffing into the prepared baking dish. Bake (uncovered) until the top is crusty and golden, about 30 minutes. *You can purchase cornbread at the bakery, use a mix, or prepare your own favorite homemade version. I used a 15-ounce box of Krusteaz Honey Cornbread Mix, baked in an 8-inch square dish. Approximately ¾ of the baked cornbread is equivalent to 6 cups diced. If you are making your own cornbread, you will need to allow for additional prep time. Yes! If you'd like to prepare your cornbread stuffing far in advance, you can assemble the stuffing as directed, cover tightly with foil, and freeze for up to 2 months. The day before Thanksgiving, allow the stuffing to thaw in the refrigerator overnight. Once thawed, bake the cornbread stuffing according to the instructions below. 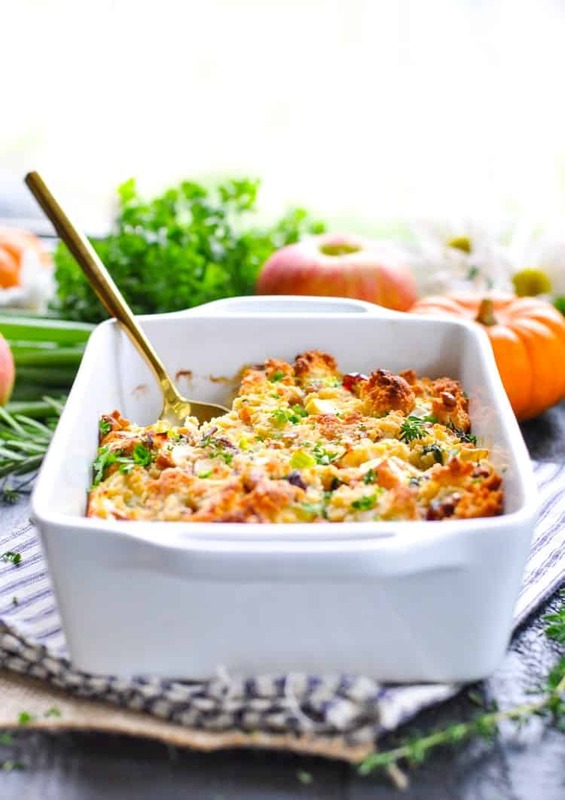 Oh I’m a sucker for cornbread stuffing…this looks wonderful, Blair! I’ve never had a stuffing with apples and cranberries before, sounds unique and delicious. Such a wonderful combo! I bet this would be the best stuffing for the holidays! You’d love the addition of the fruit, Gayle! It’s perfect for the holidays. 🙂 Thanks so much for stopping by! This looks delicious with the apples and cranberries. My mom always made cornbread stuffing, and it was my favorite dish at Thanksgiving. Awesome, Joanne! I think it’s a great option and the sweet burst from the fruit is so tasty! I made the Southern Stuffing. It was sooooo good.